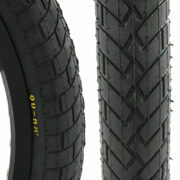 This Trials tyre differs from all other tyres in the profile. Most tyres come with a symmetric quad profile. The Try All tyre comes with a profile like a MTB tyre, therefore it is particularly suitable for natural grounds such as forest soil, sand, mud, etc. It is also suitable for Street, Flat and Urban Trials. This tyre is marked as 20″ x 2.5″, but it is to fit a 19″ rim! The marking on the tyre refers to the outer diameter of the tyre once inflated on a rim.